It has been five years now since Pelikan discontinued the production of their most interesting nibs. The sizes lost to us include the BB, 3B, OM, OB, OBB, and O3B nibs not to mention the more exotic IB and I variants. If all of those letters amount to alphabet soup for you, you can check out my post explaining Pelikan’s nib designations here. What we have been left with is the staid though faithful line-up of EF, F, M, and B sizes. In many of my posts, I have lamented the lack of character found in today’s nibs. The current philosophy behind Pelikan’s modern stock offerings seems to focus on providing a reliable though unvarying line, good for novices and advanced users alike. This “one-size-fits-all” mentality may suit the market but can leave the advanced user somewhat uninspired. What you get out of the box today is referred to as a round nib which produces the same line width on the cross stroke as it does on the down stroke. Modern nibs are wide and wet thanks to Pelikan’s generous feed but there is little to no character imparted to the writing. Contrast that with the nibs of yesterday, those from Pelikan’s early days through the mid-1960s, which provide a writing experience which I would argue is second to none. While I appreciate the focus on dependability, I do sometimes miss the excitement that a good nib can lend to the writing experience and thereby elevate the text beyond mere words on the page. Another theme that you may have seen me return to time and again is the generous and sometimes blobby amount of tipping material on Pelikan’s modern nibs. What this allows for is a robust canvas for a custom grind. 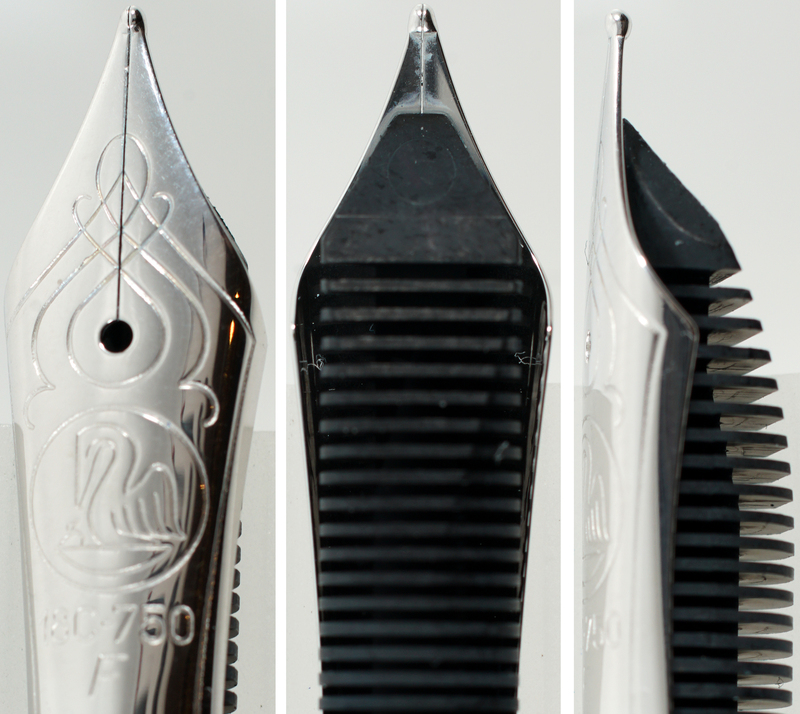 There are many accomplished nib meisters out there, specialists with an expertise in nib adjustments. They can help your nib achieve a sorely missing degree of character and I wanted to highlight for you just what can be done. Now I tend to be a traditionalist and a purist and don’t often favor customizing my nibs but I have opened up to the notion and have been handsomely rewarded. If a reliable, unvarying line suits you just fine, then read no further. If you’re at all curious to learn how you might breathe new life into a boring nib then read on. There are several different grinds out there and not all of them are suited to every writer. Different nib meisters may even offer proprietary grinds that only they provide but there are a core number of grinds that just about any specialist can set you up with. 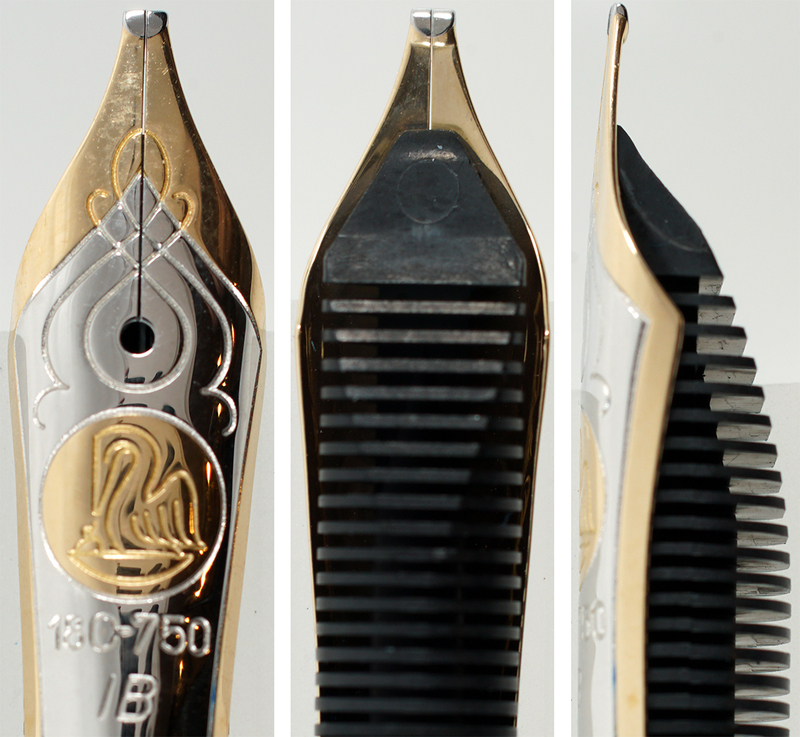 These core grinds include the round nib, the stub, the cursive italic, the oblique, and the architect. It can be confusing when you first dive in, a situation made worse by the fact that many of us don’t have the ability to sit face to face with our chosen nib meister ahead of time. It can be difficult to entrust a perfectly good nib to someone, not quite knowing what the end result will be. Hopefully this primer will help allay some of your anxiety. For completeness, I will also make mention of the stock italic nib options that Pelikan has made available over the years. While these stock nibs carry an exotic label, they actually tend to lack the degree of line variation which you might otherwise be able to achieve from an actual custom grind. **Click on any of the images below to enlarge. 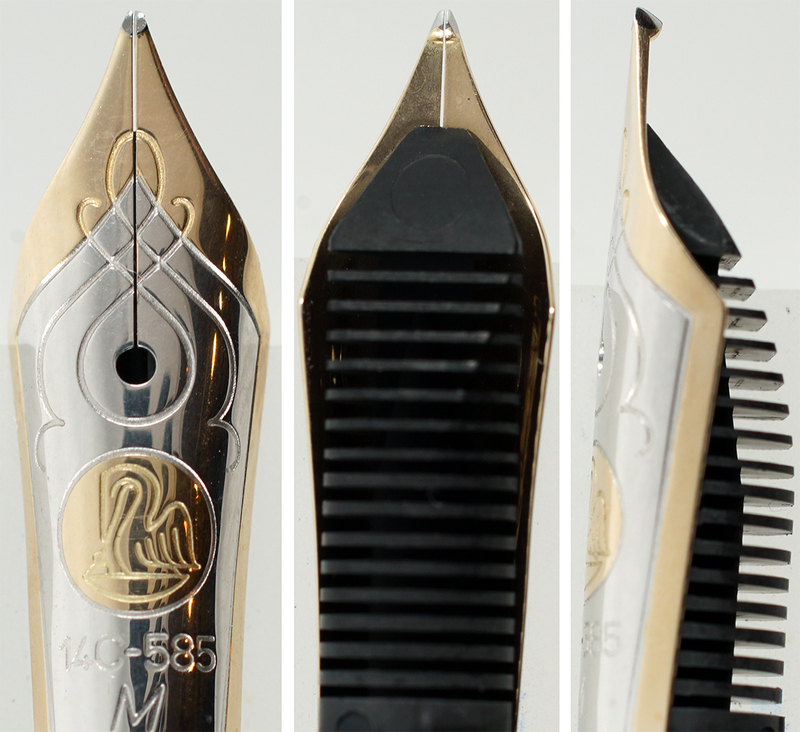 The round nib is basically what you get “out-of-the-box” when you purchase a new Pelikan fountain pen. This tip generates a cross stroke with the same width as its down stroke. The rounded design makes it very forgiving and easy to write with allowing it to appeal to a broad audience. 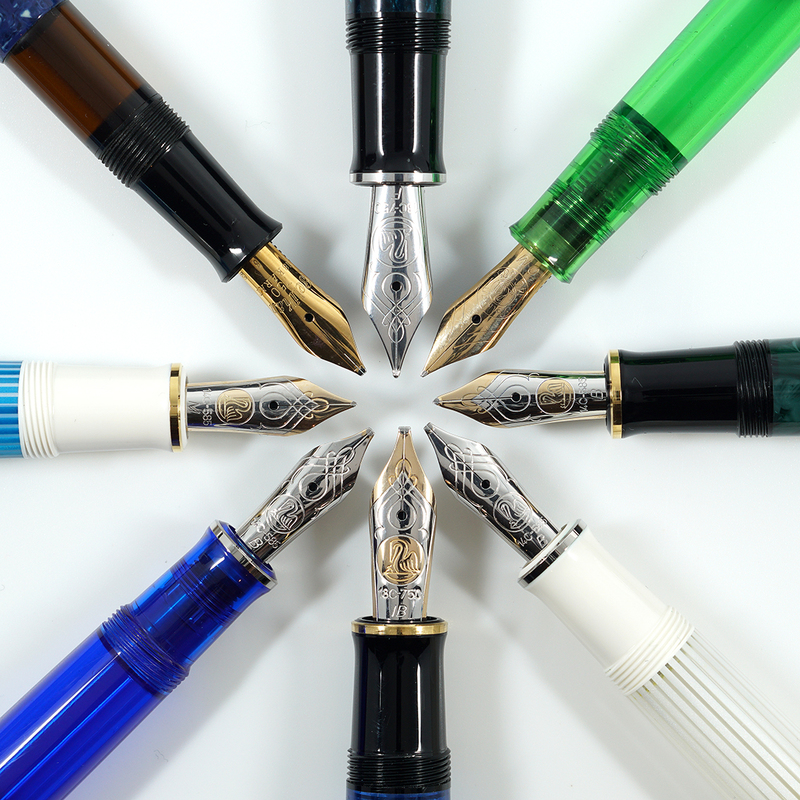 While you may not mind the lack of variation, you may not like the fact that the fine nib you just bought writes more like a medium or that the medium may put down a significantly bolder line than anticipated. If that is the case, a nib meister can reduce the size of your nib to something more to your liking and even produce a size not available from any of the company’s stock offerings. This size reduction is probably the simplest of the grinds out there. Please note that while a nib can be taken from a larger size to a smaller one relatively easily, the converse is not true unless additional tipping material is added, a service that not everyone provides. 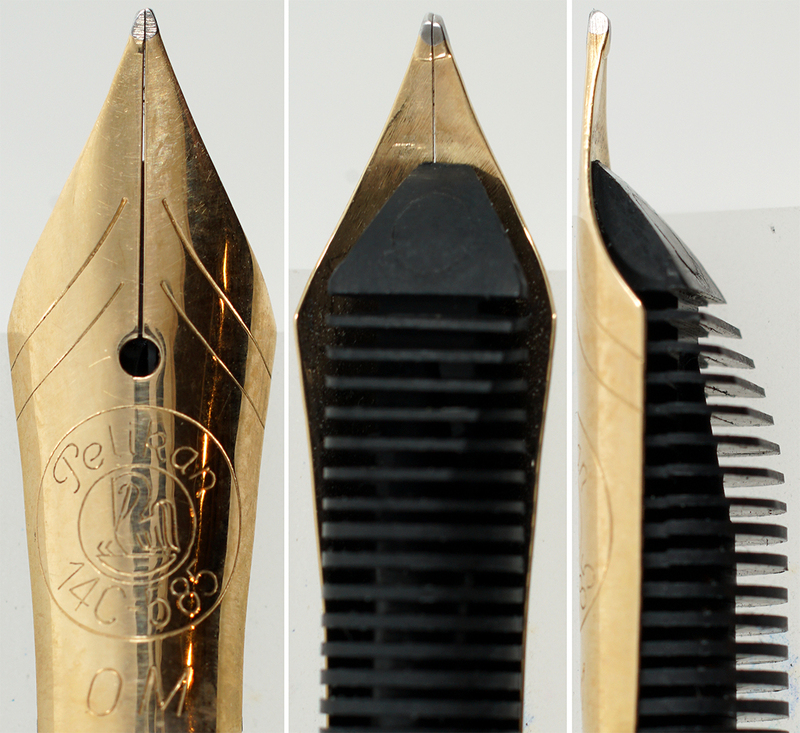 The stub nib is created when the circular tipping is ground into more of a rectangular shape. The outer edges are then rounded off thereby preserving much of the smoothness that the traditional round nib is known for. This seemingly small adjustment allows for a thin cross stroke and a thicker down stroke. The exact dimensions can vary depending on the amount of starting material and the effect that you’re trying to achieve. That said, there is a floor as to how small you can go with this one before you essentially lose the line variation. This is the most user friendly of the custom grinds because it imparts some nice variability to the line width while preserving much of the smoothness of the round nib. If you’re just starting to explore the world of custom grinds, this is a good one to try first. The cursive italic nib plays on the stub concept with the squared tipping but does not round off the edges which are left a bit more sharp. The effect is that the cross stroke of the cursive italic is thinner than that of the stub while still creating that thicker down stroke. The sharper edges do result in a bit less smoothness than the stub and requires a little more care as to the nib’s orientation when writing. These can be ground somewhat smaller than the stub while still preserving a noticeable line variation. If you want to take this concept to the extreme, there is also the sharp or crisp italic variant which has extremely sharp edges that results in a more toothy feel but allows you to achieve maximum variability. These are not well suited for daily writing and have more of a place in calligraphy. 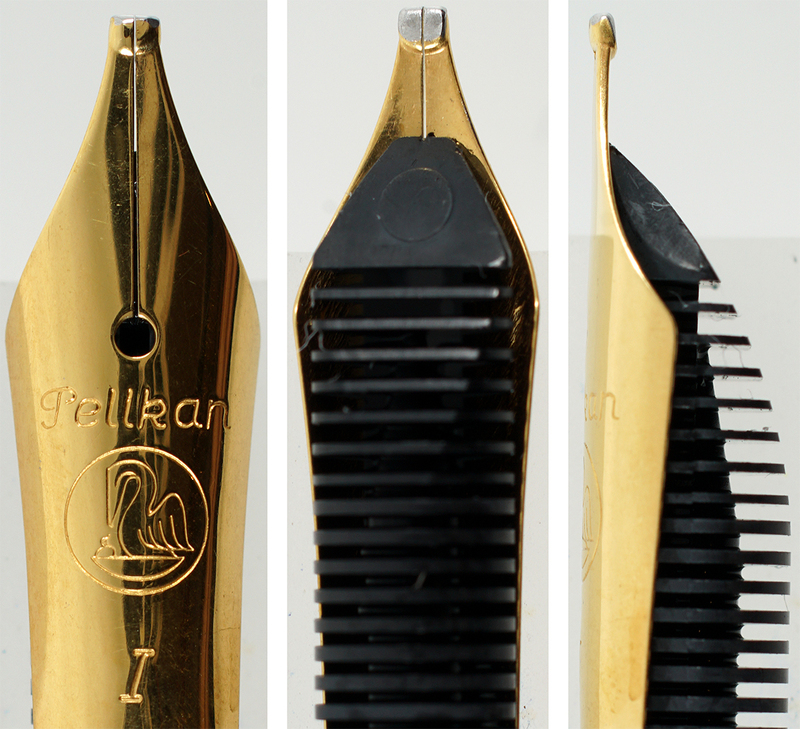 Oblique nibs have been around forever and were part of Pelikan’s stock line-up until five years ago. There are left foot obliques (commonly referred to as “oblique”) and right footed obliques (known as “reverse oblique”) that basically compensate for writers who rotate their pen. An oblique tip is usually cut 15 to 45 degrees from the horizontal. This type of grind is good if, for example, you are a right handed writer who rotates the pen counter-clockwise. These are not intended to impart significant variability in and of themselves but they can be customized and ground to an italic or a stub if so desired. For instance, with a left foot oblique, an italic grind done at an angle matching the angle of the pen in relation to the direction of the writing will come out like an architect with a thicker cross stroke and a thinner down stroke. The architect nib (also know as the Hebrew or Arabic nib) basically takes the concept of a stub and rotates it 90 degrees thereby creating thinner down strokes and thicker cross strokes. The uniqueness of this grind means that some care must be taken to hold the pen at the proper angle to the paper so it is especially important to discuss at what angle you hold your pen such that the grind will be to your liking. Notice in the example below that the diagonal line is actually the thin stroke which may seem contrary to the above but actually has to do with the angle of the pen in relation to the direction of the writing (two little children under foot means that the writing examples in this post were literally done in a stairwell so the angle of writing was less than ideal ¯\_(ツ)_/¯). 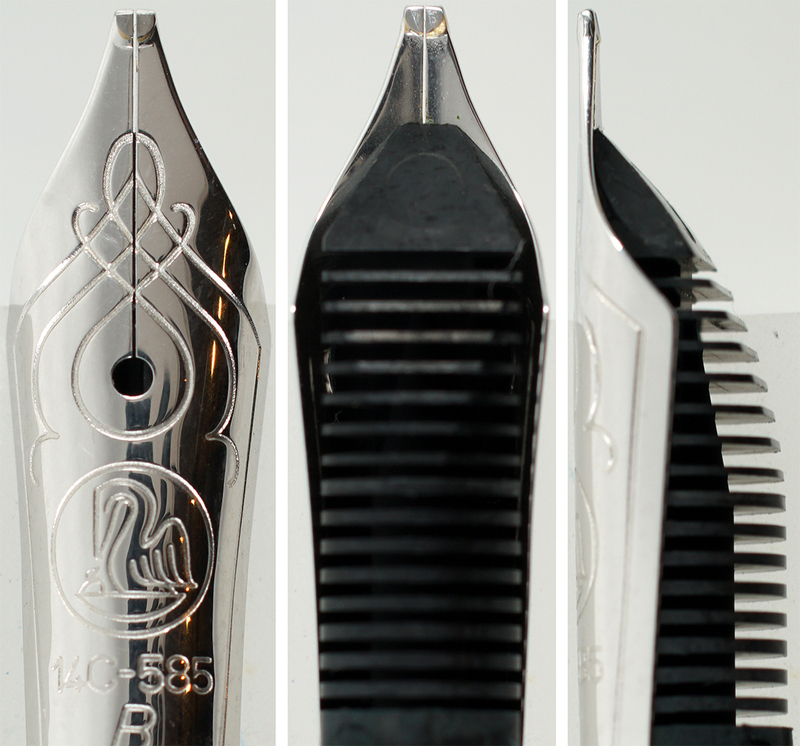 In July of 2010, Pelikan released a stock nib in italic broad for its M800 line. While it is nice to see this kind of effort from the company, the labeling is a bit misleading. It has been my experience that these nibs offer broad lines and a smooth writing experience consistent with a more stub like behavior rather than a true italic. The downstroke is about 1.5mm with a cross stroke of 0.5mm. The factory offerings are usually less likely to achieve the same degree of line width variation that you would otherwise get with a comparable custom grind. These are currently no longer in production. 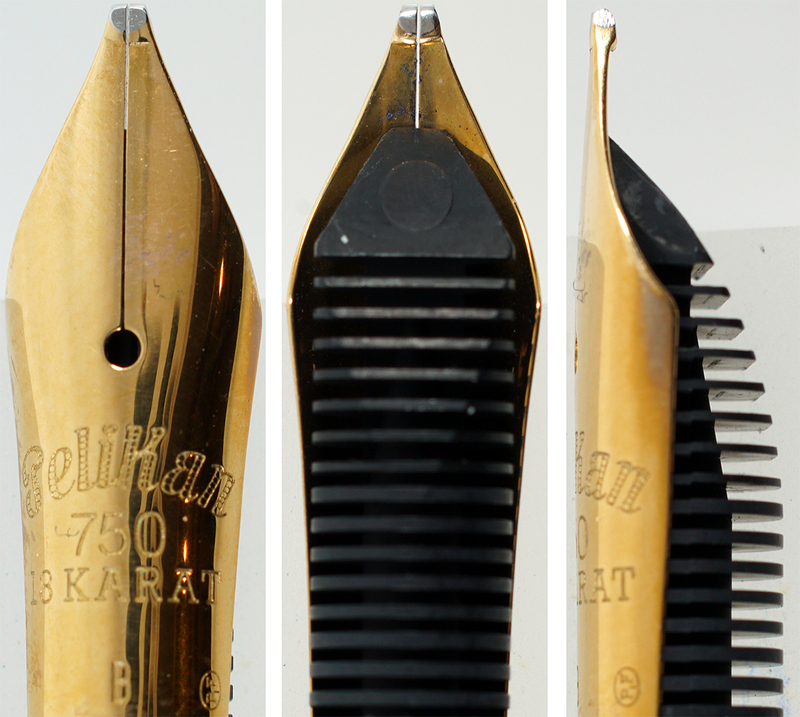 Sometime around 2008, Pelikan released a stock nib in an italic medium for their classic M200 line. These are gold-plated stainless steel nibs simply stamped with an I. While not as broad as the IB of the M800, the italic medium also acts more like a stub than a cursive italic grind. You can still find these for sale from time to time but they are no longer widely available. What is your preferred ink flow (extra dry to extra wet)? Do you write left or right handed? How hard do you press when you write? What is your usual writing style (cursive or block)? Do you write in small or large letters? At what angle to the paper do you hold your pen? Do you rotate your pen when writing? One final thought to leave you with is that a custom grind doesn’t have to break the bank. Most specialist charge between $30-45 depending on the job to be done. While this expense is added to the outlay already made for the pen, the added enjoyment derived from a custom nib is money well spent. **The above list captures many of today’s nib specialist but is not meant to be all-inclusive. Inclusion on this list should not be taken as an endorsement just as exclusion from this list does not constitute a slight to anyone I may have forgotten. This is simply meant as a starting point for your nib grinding needs. Thanks, Joshua. Very useful post. Are you aware of any nib grinders in Europe? Pablo Carrasco (fpnibs.com) is based in Spain. Reviews that I read about his work were all positive, and encouraged me to try an architect grind (albeit on a stock JoWo nib – since he does those right away, as opposed to when you want to send him your own pens/nibs). Although it didn’t quite compliment my handwriting, the nib work was excellent, and I had him put my name down on his list for grinds on nibs not purchased from him. I have a couple of spare m205 units that I intend to have converted to a cursive italic and stubs. Thanks for adding to the list of European nib specialist! Thank you. I’ll give them a try. Thanks Anthony. I don’t have a lot of insight into the European market. I know Goldbibs.com do a lot of restoration and nib work so you may want to contact them. They are located in Spain. I have also heard John Sorowka in the U.K. spoken very highly of. Not sure if he still does nib work or not nor do I know how to contact him. There are a couple of threads on FPN about his work. Thanks, Joshua. I’ll check those out. I’ve always gotten some nice Architect grinds from Pablo and Esther of FPNibs.com and they’re based out of souther Spain, I believe? You might want to check them out. I have no affiliation with them… just a satisfied customer passing along the word. Thanks, will definitely try them. Thanks, Joshua. I currently have two pens with custom grinds. A TWSBI 580 B ground by Art Van Haselen of artsnibs.com with his Tomahawk grind. Mine is a stub, but he could do CI as well. He did good work. Ultimately the time commitment required by his day job did not allow him to continue doing nib work. I believe he was an attorney, and if he was an associate (or even a partner) he would have a large time commitment there. When he returned the 580 he included a Jinhao 599 that has an identical grind to its M nib. Some people waited months for work to be done towards the end. I was in early enough that turnaround was just a couple of weeks. Including mailing time. This is in addition to factory nibs such as a OB in a M200 old style blue marbled, and 1.1 mm factory nibs from Lamy and TWSBI. Anthony – I don’t know the names, but have heard of a couple in Europe. At least one in the UK. Sorry, I don’t recall names as I am in the US. I’d heard of Art Van Haselen but never partook of his services. Love the nomenclature of a “Tomahawk” grind. What kind of a line is that? The tomahawk is more appearance – unless it softens the nib. Basically cutouts in some places along the edges of the nib. The one I have is just a regular stub line wise, that was a factory B. Never measured the line. Very interesting. Thanks for the follow up. I found a nice view of it in this FPN post. Looks like a stub with the intent of adding a little additional spring to the nib. Definitely a unique look about it. Thank you Deb for throwing Joshua’s name in as well. Always nice to have options and more nib specialist hopefully may mean shorter turn around times. I’ve missed those special nibs so much, especially the flexible nibs. I wonder why modern nibs though for those named flexible do not perform the same as those in the old days. No, I don’t think it’s a matter of technology lost. When ballpoints took over, people began writing harder and the fine touch of how to use a nib was gradually lost. Now everyone is so used to writing firm, the nibs have responded in kind to accomodate that. If yesteryears nibs were fitted to today’s pens, I can only imagine the complaints/damaged returns that the company might have to deal with. All a theory of course but rather than tech lost, it seems an adaptation to the modern (fountain pen) novice user. I’d like to say as well that not only has the writing style changed which in turn created the need for the rigid nibs we see today. But the alloy metals added to the 14c gold were a key feature of those vintage flexible points people crave today. Couple that with the forging and tempering needed to give the metal the spring it needs to come back to zero after a flex, you have a very unique set of skills that just became redundant with the advent of manifold nibs. Oh…and I also believe that companies just don’t want the warranty claims/bad press that would result almost immediately from overzealous flexers. Nice article but the penmanship in the examples is uninspiring and doesn’t clearly illustrate the nib characteristics as intended. Thank you for the critique Loren. I share your sentiments. The nibs shine much more with cursive writing but sadly I have lost that skill and my cursive is atrocious. Also, the writing conditions were much less than ideal. Sadly I work 10-12 hours a day 24 days a month with two small children at home which means I do what I can when I can. While the examples don’t shine, I hope the spirit of the post comes through. Thanks for a really interesting article. I have always used John Mottishaw for any pens I buy and have been really happy with them. He doesn’t do them all himself any more but the most recent pen I bought writes beautifully even though one of his colleagues did it. I have the standard Pelikan italic nib on one of my pens and have never really been happy with it, but maybe italic is just not my thing. I have an M605 Marine Blue purchased from John that I had turned into a stub. It was my first custom grind but obviously not my last. They do good work indeed. Thanks for a really nice review of nib customization and especially the writing samples. With your day job it’s amazing that you can do any of this. But I particularly like your “uninspiring” penmanship–one can clearly see the difference in the nib types but your handwriting is much closer to us ordinary writers who can sometimes be quite intimidated by John Mottishaw’s exemplar videos. So, good wishes for your continued efforts here. Very inspiring and of course costs me a lot of money in searching out new Pelikans and having nibmeister’s tune them. Thank you for your kind words Cheryl. Glad you enjoyed the post. I’m always envious of some of the amazing penmanship out there. Something that I would like to strive for should I ever gather up an adequate amount of time. Thanks, Joshua, for an excellent explanation of various nib grinds. As usual, your writing is concise and informative. I have several M2XXs that I have bought M4XX nibs for. Most of those have been purchased from Classic Fountain Pens and were reground to stubs by one or the other of John Mottishaw’s apprentices, Gena and Jessica. They have always done an excellent job for me and are my favorite among several various nibmeisters I have tried. I’ve had some other stubs ground by other nibmeisters, too, and they are also excellent; however, the stubs done by CFP seem to suit my style of writing best. I think it is important to point out that a grind done by one nibmeister vs. that of another may both be of the same quality, but one of them just may not suit a particular writer as well as the other. It’s a very subjective thing; each person’s writing style and the way they hold their pen play a huge part in the results. I’ve learned it’s also very important to be cognizant of your own particular style of writing and how you hold your pen. A few months ago I was told by an experienced nib grinder that I hold my pen at a very high angle; about 65* off the paper, vs. the usual or “average” 45* – 50*. Now that I am aware of that, I make sure to tell anyone who is grinding a nib for me about that fact. It has resulted in better grinds that suit my hand perfectly. I’ve also learned that I like my stubs slightly rounded; a little more than usual. Knowing this type of information about yourself results in better results if you communicate these features about your writing style to a competent nibmeister. All very good points Debi. Knowing yourself and your writing style and being able to convey that to your nib meister goes a long way to achieving an exceptional result. Hello. I used Edelstein’s Smoky Quartz. There is a world of difference between ’50-65 stubbish semi-flex obliques, and later ones (The later ones regular flex, semi-nail or nails which IMO are a waste of money for line variation.). The vintage 400’s nibs will fit semi-vintage ’82-97 or modern 400’s and 600’s. Vintage is @ 1/2 a width narrower than modern. Modern stub is “OK” but vintage ‘normal’ semi-flex being stubs, give good old fasioned fountain pen flair with out grinding. I agree with your assessment here for the most part. The older nibs provided such great flair without really trying. I don’t object to the nails as much as you do though and feel that they too have a place. That’s the nice thing about the variety available. This is another excellent article. Thank you so much. More than a decade back, during my visit to Germany, I bought couple of Pelikans (one is M800 and another is an M600) with nibs that were customized (one IB and another formal italic grind on a broad nib) at their factory located at Vohrum (near Hanover). I, most probably, will buy another Pelikan early next year, this time probably from Classic Fountain Pens. Thank you very much. Those grinds sound like the perfect compliment to those two pens, made all the more special having been done at the factory itself. I hope to do similar one day though that would be a long way off.